My husband bought me a 2" phal and I was just curious if I should re-pot it? I do not have a green thumb and I'm nervous about killing it. Probably Not Necessary Yet, But Make Sure The Pot Drains! What a beautiful picture of a beautiful little orchid. I love it. I love Phalaenopsis orchids, especially the little ones. You probably do not need to repot it yet. Definitely wait until it has finished blooming so that you do not break the beautiful flower spike. But, AND this is important, make sure that the pot that it is in drains. Phalaenopsis orchids need to drain aw they are prone to root rot if they do not. 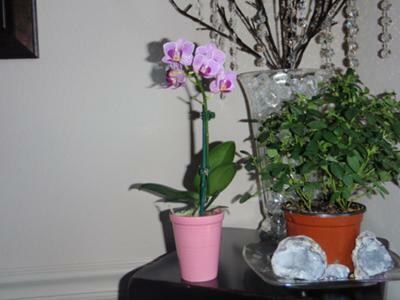 Sometimes orchids as gifts will come in decorative pots and the pots do not drain. It is ok to keep them in the pots as long as there is another pot inside that does drain. That way you can take it out of the pot that does not drain and water it and put it back in. Both of these have tons of good free information and will help you along in your understanding of what this plant needs to thrive.